At p/hop we believe fund-raising should be fun, and accessible to everyone. There are lots of free and easy ways to help and raise awareness about the awesome work of MSF. One of the easiest ways to help p/hop is to spread the word. It’s also free. If you like something, or everything we do, please share it using the magic of the internet. Add a link to our site using our badge, or write a blog post about one of our patterns or events. This is a great way to share p/hop with your friends. Obviously you can write about your experience with p/hop, post any p/hop swaps you have going on or show off the finished product made from your p/hop pattern. And, buttons for your blog or social network profile! We have over 60 beautiful patterns for you to download. All we ask is that you make a donation to MSF based on the hours of pleasure that you will gain from the pattern. p/hop = pennies per hours of pleasure. If you run a yarn shop or craft store you can download a selection of our our patterns direct from our website and make them available in your store for a donation to MSF. You can also use our patterns to showcase your beautiful yarns. We are happy to send you some MSF literature and a collection box. Please email us if you would like more information. This is a great way to clear out some stash and get some fab new-to-yarns while supporting p/hop. Check out the yarn swaps that have already raised loads of money and awareness for MSF. We wouldn’t get far with our fundraising if we didn’t have lovely designers donating their patterns to us. Our submission guidelines are here. p/hop’s first outing to a knitting show in 2008. Whilst we’d love to attend all the wonderful fibre events around the country, we unfortunately don’t have the resources. However we’d be thrilled if you would like to run a stall for p/hop at a yarn event near you. 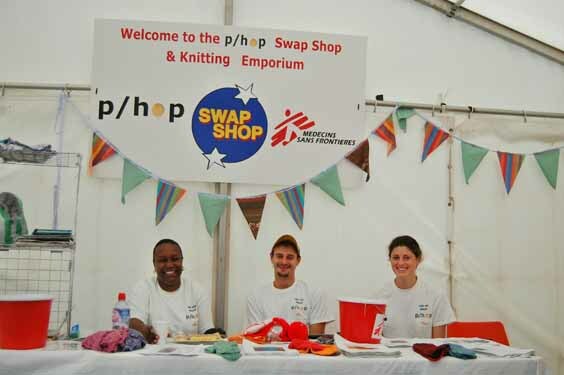 We’ll be able to guide you and send literature on MSF, collection buckets and stickers and some sample knits, everything you need to make your stall look great. More details coming soon. Take a look at the first Knit Surgeries which were thought up by one of our brilliant supporters, Karen Wessel. Thanks Karen. We are always open to new ideas and fund-raising suggestions. If you have a great idea we would love to hear it. Either start a thread in our Ravelry group or contact us. If you are holding a knitting, crochet or other fibre related event for MSF please let us know, we would love you to write a blog post about your event, both publicising it and writing a review of it. This is a community project, so the more knitters and crocheters put in, the more MSF and the people they help get out of it.